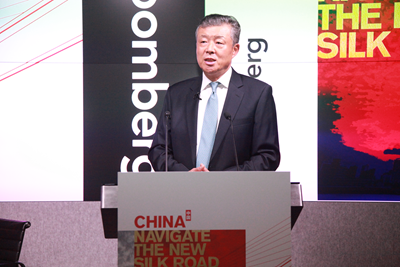 On June 15, Ambassador Liu Xiaoming was invited to attend Bloomberg's Investor Roadshow themed "China: Navigate the New Silk Road" and delivered a keynote speech entitled "Belt and Road - A New Chapter of China-UK Cooperation". More than 200 entrepreneurs, financiers, experts and scholars from leading financial institutions, asset management enterprises, law firms and accounting firms attended the event. Ambassador Liu noted that the Belt and Road Initiative meant a great deal to the region and to the world. First, the Initiative points out the way to peace and prosperity. It will not only promote economic integration, but also will be our anchor and compass in safeguarding regional stability and world peace. Second, the Initiative is helping to shape open and global cooperation. It will facilitate the orderly flow of production factors, enable efficient allocation of resources, lead to a higher degree of market integration, create new and effective demand, and build up new value chains. Third, the Initiative sets up a new stage for exchanges and innovation. It seeks to enhance ties in education, science and technology, culture, health, tourism, and sports. Fourth, the Initiative demonstrates China's down-to-earth approach and sense of global responsibility. It serves as a platform for countries to share development practice and the benefit of growth. Ambassador Liu said that the fundamentals of China's economy remained positive in the long run. China will keep growing at a mid-to-high speed and steadily move up to become a mid-to-high income economy. As China carries on with comprehensive deepening of reforms at home and opens its door wider to the world, it will continue to be a prime destination for global investors. Meanwhile, China has huge market potential, abundant human resources and increasing industrial capabilities, which will create huge market demand and abundant cooperation opportunities. Ambassador Liu stressed that, with the consolidation of the "Golden Era" of China-UK relations, China-UK financial cooperation promised a great deal to be achieved if the two countries could join forces in three aspects. First, the two sides should make good use of policy bonuses. The financial departments of China and the UK have had multi-level and wide-ranging policy communication and dialogues, and a broad consensus has been reached. The two countries can engage each other in closer exchange and cooperation in asset management, banking, capital market, insurance and pension, and exert the strength to lead the development of green finance, fin-tech and financial inclusion. Second, the two sides should leverage respective strengths. In building the Belt and Road, the UK's strength, including experience, knowledge and creativity will find a good match with China's strength such as unique growth model, technology and marketing capability. As countries along the Belt and Road routes open their doors to innovative financial cooperation, this will unleash the potential for cooperation with China and Britain. Third, the two sides should tap into market potential. China and Britain should seize the opportunity to accelerate the pace for London to become a global RMB offshore centre and to achieve win-win by diversifying financial products, expanding transaction volume, and increasing market connectivity. 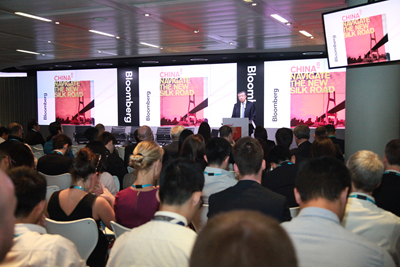 This Investor Roadshow themed on Belt and Road Initiative is a signature project of Bloomberg, which consists of seminars in major international financial centers. The participants exchanged views on China's macroeconomic prospects and investment opportunities in China's bond and stock markets, etc.